Green Roads CBD Sleepy Z’s is the perfect recipe for a long night’s sleep. Buy Green Roads CBD Sleepy Z’s now for relief from sleepless nights! Why wait? Green Roads CBD Sleepy Z’s can reduce feelings of anxiety. So people suffering from anxiety disorders can always trust Green Roads CBD Sleepy Z’s! People suffering from stress are also recommended to consume the CBD Sleepy Z’s from Green Roads! They provide the ultimate relief from stress. This product may also be able to relieve symptoms of depression. You can check the reviews to see that it works! This product can always help you to get instant relief from pain and distress. The CBD gummies may reduce acne to a certain extent. However, the root cause must be found in order to determine whether this is possible. CBD also has neuroprotective properties, so it can actually be helpful for people suffering from neurodegenerative disorders. People suffering from bad heart health can use these CBD gummies to get some relief. Some studies suggest that CBD may be able to assist people with schizophrenia and other mental issues by reducing psychotic symptoms. CBD has been shown to modify circuits in the brain identified with drug addiction. In diabetic mice, treatments with CBD lessened the incidence of diabetes by 56% and significantly diminished inflammation. Considering the product, Green Roads CBD Sleepy Z’s is definitely a thing to look into buying. Green Roads always bring out products with the best quality. You can always check for more from the brand review here! Green Roads CBD Sleepy Z’s may have a key effect in treating severe medical conditions such as anxiety, stress and much more. Apart from this, the product may also be able to help in treating neurological disorders and much more. With relief from symptoms, it’s easy to get a good night’s sleep. Medical marijuana consists of more than 100 different compounds called cannabinoids. The reason that examination on the impacts of these cannabinoids has been so restricted is a direct result of the anti-marijuana laws that were introduced not too long ago. Upon investigation of these compounds, it has been found that every kind of cannabinoid affects the human body in some way. There are three main cannabinoids that give patients the most relief: cannabidiol, caryophyllene and cannabigerol. Cannabidiol is one of the major cannabinoids accounting for almost 40% of the cannabinoids found in the plant. Cannabidiol can lighten inflammation, convulsions, sickness, anxiety, and more. This compound has likewise been observed to be successful with schizophrenics as an antipsychotic. 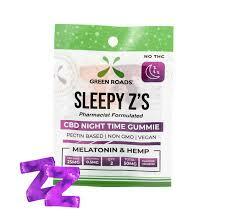 The Green Roads CBD Sleepy Z’s come with a very moderate price tag, and you can get the gummies from just $10.00! The capsules are great to consume and also to get the best results in time. With the pack, the capsules come with size of 2 x 25 mg Zs! So, why wait for more? You can simply head to their website and get the best benefits now! 0.5 mg of melatonin per gummy!